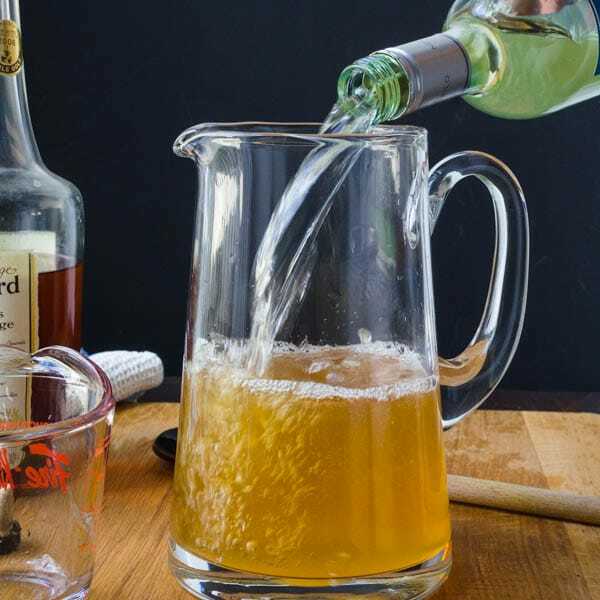 If you need pitcher cocktails for your 4th of July celebration or Summer barbecue, this white sangria with brandy is a great option. Not only is Red White and Blue Sangria a beautiful, tasty 4th of July cocktail, but wine spritzer recipes are so quenching on a hot day. If you browse through the past 4 1/2 years of this blog, you won’t find much in the way of “literal” translations of holiday recipes. While I do have several iterations of pumpkin bread for Thanksgiving and Christmas cookie recipes galore, not to mention tasty food inspiration for Memorial Day, 4th of July and Labor Day, there aren’t any “pilgrim” decorated cupcakes or Grinch-y cookies and to date, I’ve avoided flag-inspired food. Until now. 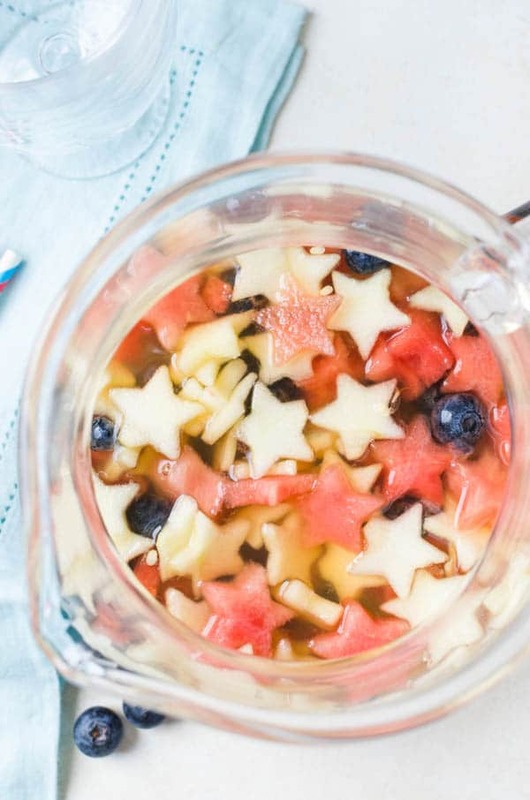 Red White and Blue Sangria is delightfully patriotic without being cartoonishly literal. I’m not opposed to those crafty folks who can make a deviled egg look like an Easter chick but since my daughter is grown up, there just doesn’t seem to be any point to doing that in our house. However, my fuddy-duddiness ends now with this Red White and Blue Sangria. 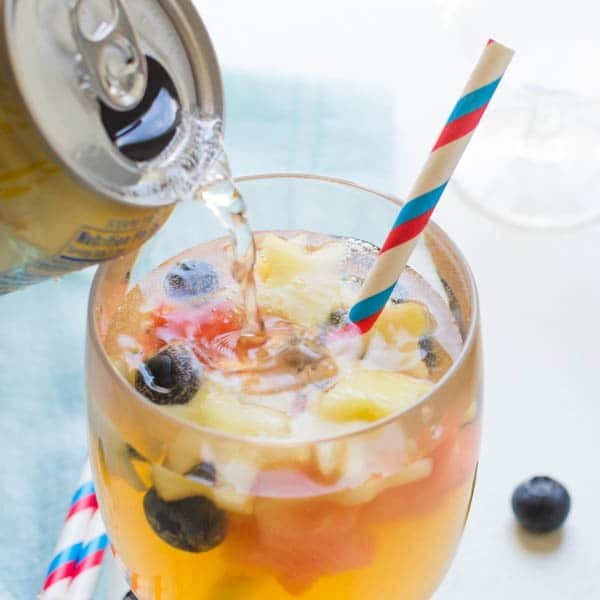 This white wine sangria recipe makes 4th of July cocktails that are simultaneously patriotic and refreshing. Start your Red White and Blue Sangria several hours before serving or even the day before so the fruit and liquors can infuse. Into a large pitcher, add a good, drinkable white wine (I like a sauvignon blanc, but a pinot grigio, sancerre or vouvray would be nice too). Add a sweetener. 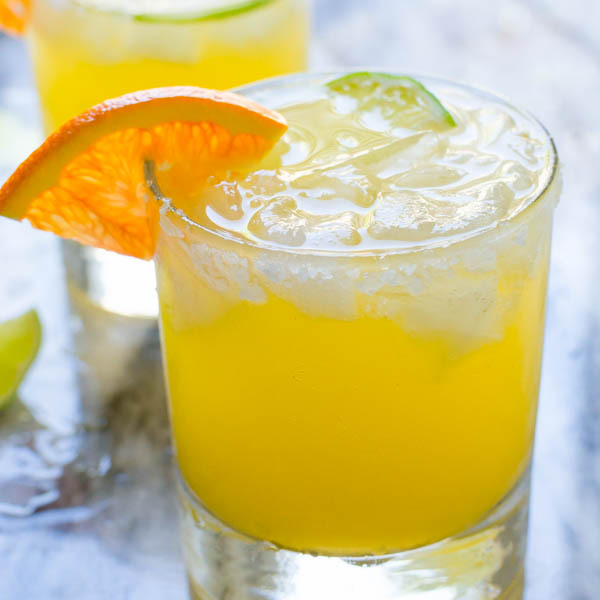 This could be in the form of simple syrup (equal parts water and sugar), agave, or honey. For this version, I use a honey simple syrup . Add the brandy. For this one, I like Calvados — a French apple brandy that I think is pretty special. It can sometimes be hard to find, not to mention a bit expensive. You can substitute another good sippable brandy if you can’t find Calvados. 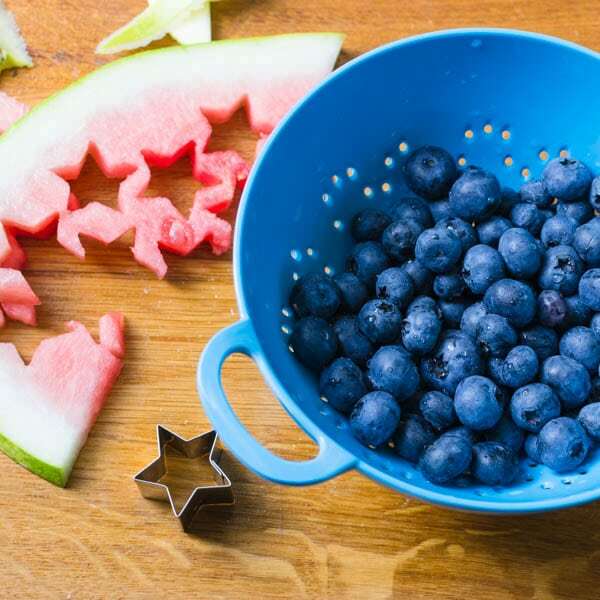 Cut the fruit – if you’re using the star cutters, slice the fruit into 1/4″- 1/2″ slices and use the cutters to create the star shapes. 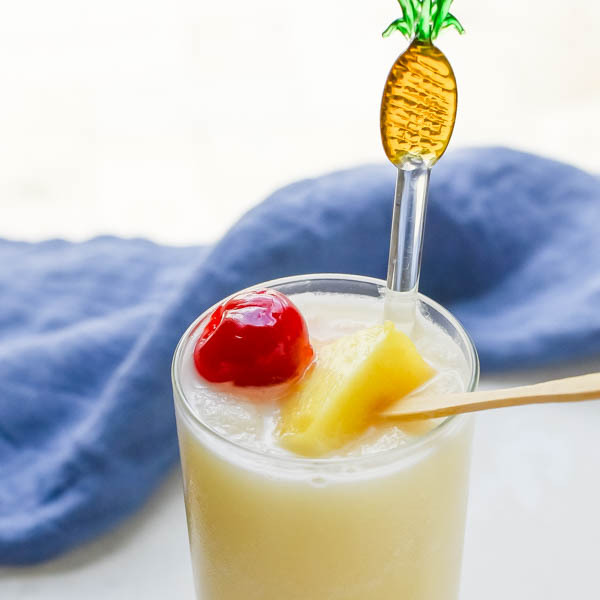 Otherwise, chop the fruit into bite sized chunks (leave berries whole) and add them to the pitcher. Chill the sangria for several hours until well chilled or overnight.Just before serving add the sparkling water to the pitcher, or individually to each glass of Red White and Blue Sangria. Here are some ideas for the red white and blue fruit (note, not all fruit really work for cutting out star shapes). While you can certainly use any red fruits you like in your 4th of July cocktails, I’m particular to watermelon for two reasons. First, it’s really easy to cut into shapes (I’m including links below for star shaped cutters) – the flesh yields easily to the cutter and it holds its shape beautifully. The second reason is osmosis. You know, molecules flowing across a semipermeable membrane until a homeostatic state is created. The osmosis effect is less noticeable with apple slices, but apples are certainly the perfect tart, white fruit for the star cut out – though I think it would be really eye-popping with dragon fruit and their little black seeds (my market was out of them when I looked). After the fruit and liquor have had a good soak, they’re ready for a party. 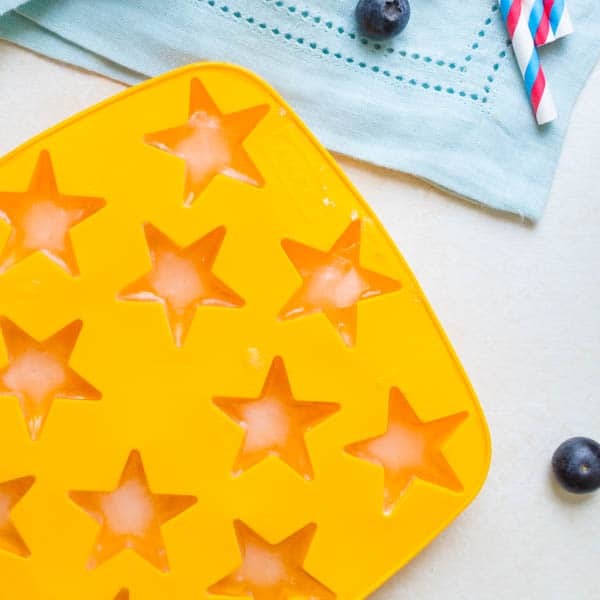 To make it extra festive, I used these star-shaped ice cube trays to keep this white sangria with brandy cold. I got these at Ikea several years ago, so I’m not sure if they still have them, but I’ve added affiliate links for a similar ice cube mold at the end of this post in case you want to get your own. This 4th of July cocktail is perfect as it is, but if you like a little fizz, add the sparkling water for effervescence. 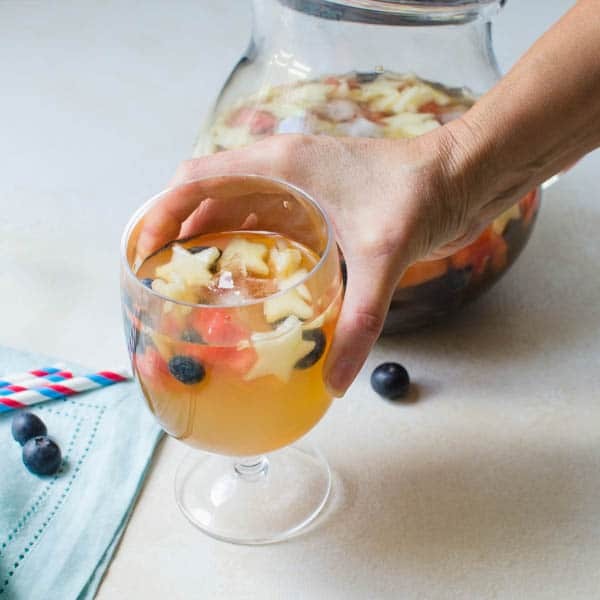 Red White and Blue Sangria is ready for your holiday barbecue, picnic, or potluck! Enjoy! If you have the star ice cube molds, fill them with water and freeze until you have about 3 cups of star shaped ice cubes. 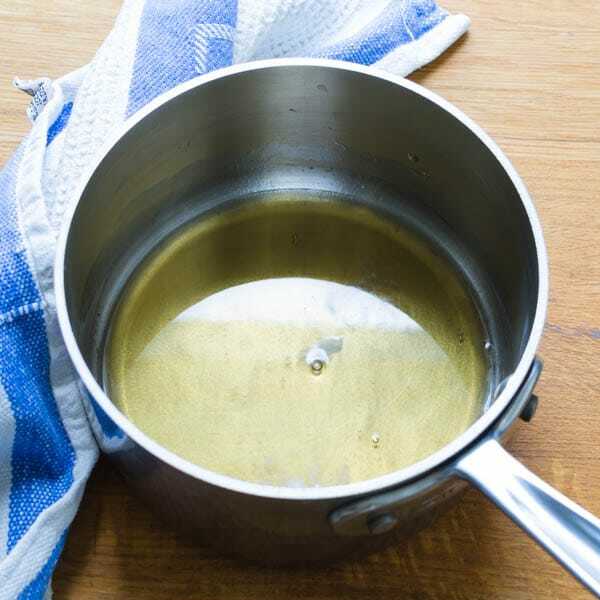 In a small saucepan combine the honey and water over medium heat and cook, stirring constantly until mixture becomes a honey simple syrup. Remove from heat to cool. 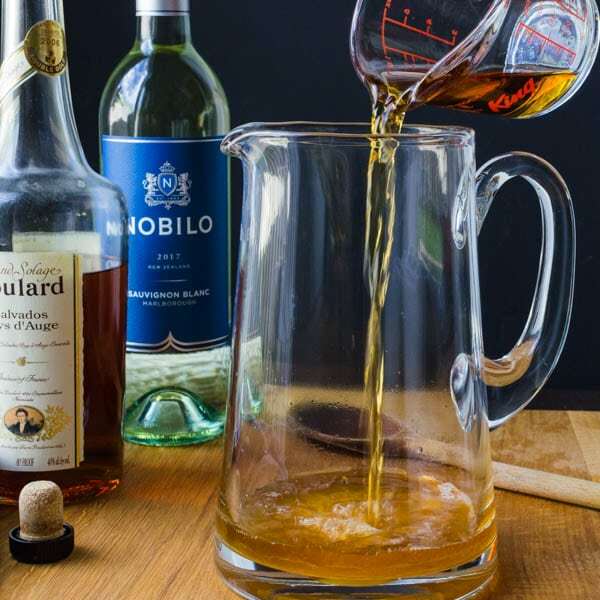 Add the calvados, honey simple syrup and bottle of wine to a large pitcher. Slice the apple into 1/4" thin slices. 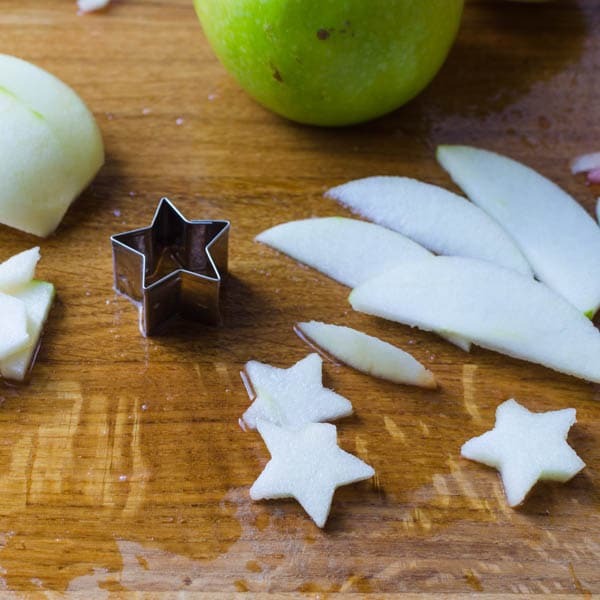 Use the star cutter to press out stars in the apple flesh until you have about 1 cup of apple stars. 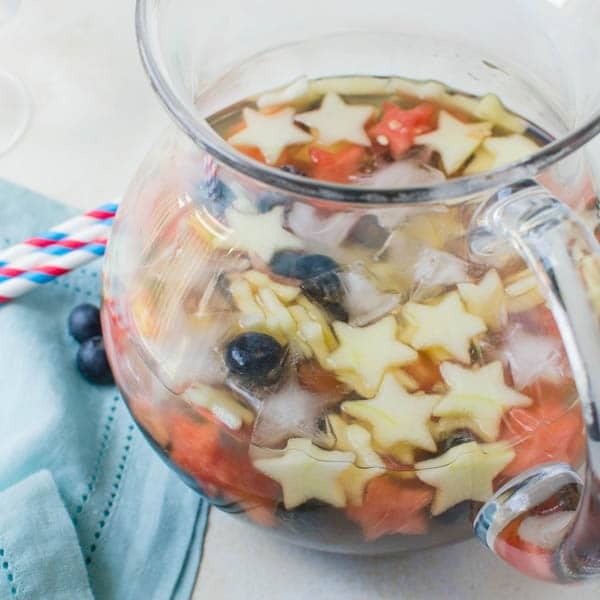 Add the stars to the sangria. 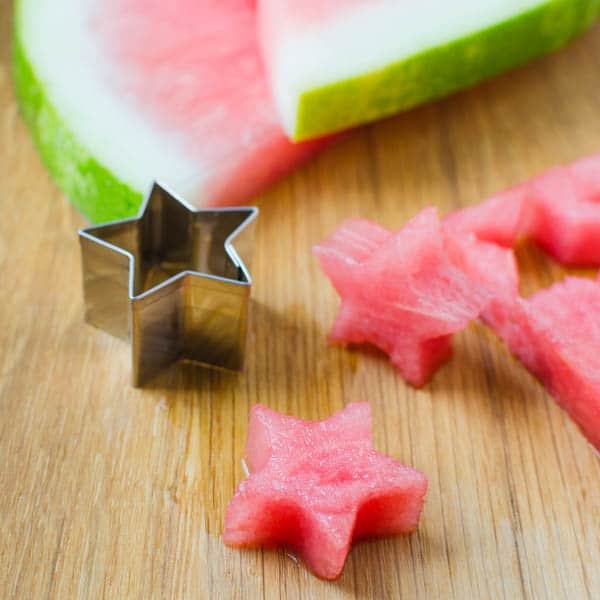 Use the star cutter to press out stars in the watermelon slices and add them to the sangria. Add the blueberries to the sangria, stir and refrigerate for 3 hours or until very cold. Add the sparkling water to the pitcher along with the star shaped ice cubes and serve. This is a delicious way to celebrate in a fun patriotic style. Love it. I simply adore this red white and blue sangria!! I especially love the star shapes. I have got to get me a little star cutter and ice cube tray!! 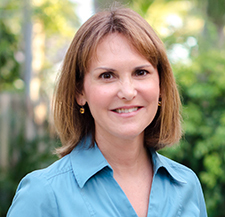 Your photos are beautiful and fun! And I can’t wait to try your sangria recipe before 4th of July, just to make sure it’s as delicious as it looks. You know, for research. Yes, research. Of course, research — and Quality Control. This sounds perfect for the 4th of July. Such a fun and festive idea. Can’t wait to try this! I am going to have to make a huge batch of this for our next garden party. It sounds delicious. 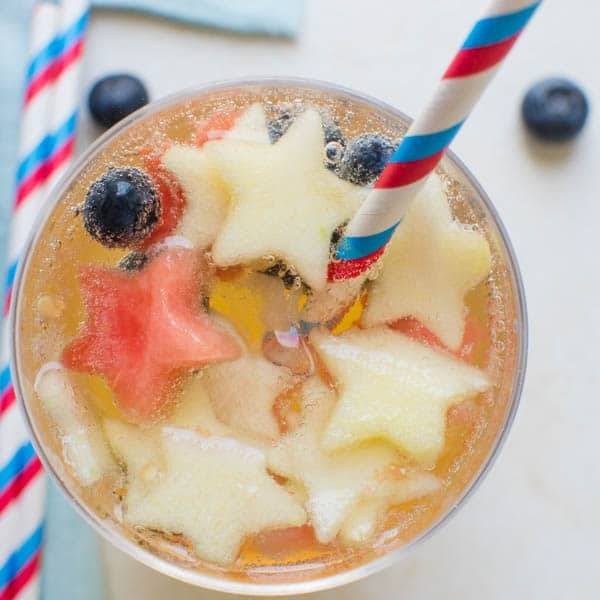 What a fun and delicious drink – LOVE the star shaped fruit.